Can you tell us a little about your job at the Angel Inn at Hetton, and how you came to be doing it? I was the black sheep of the family - the Prodigal Son’s got nothing on me! A late developer, I got a degree in Third World Studies and thought I’d try teaching but hated it. One day I said ‘Dad do you think I should apply for a job as a wine advisor?’ and he replied ‘Oh Pascal I’ve been waiting 30 years for you to come out with some sense like that!’ So I worked for Oddbins for 2 years and then came home to work in the family wine business which was an add on to The Angel Inn, pub and restaurant. Today we have changed what we do so the wine business no longer exists. I now look after the Marketing, Front of House and the Wine List at the Angel. Adding new wines to the wine list, discovering new amazing beauties that will enhance the list and really enhance our customers’ experiences. We are a family business and are an ethical one: we've raised 10’s of 1000's of pounds for charities over the years. We only put a fixed mark-up on bottles of wine and so don’t rip people off. We have an approach to employing staff whereby we are just as concerned about their personal development as we are their professional and will always go the extra mile when people get into difficulty. The Angel Inn at Hetton, there’s nothing like a warm welcome, a fabulous meal and an excellent glass of wine to put a smile on someone’s face. Spare time what’s that? I have a 2 year old and a 1 year old! Town End Farm Shop at Airton, a fabulous family business with home reared meats and charcuterie and a vast selection of Yorkshire goodies. 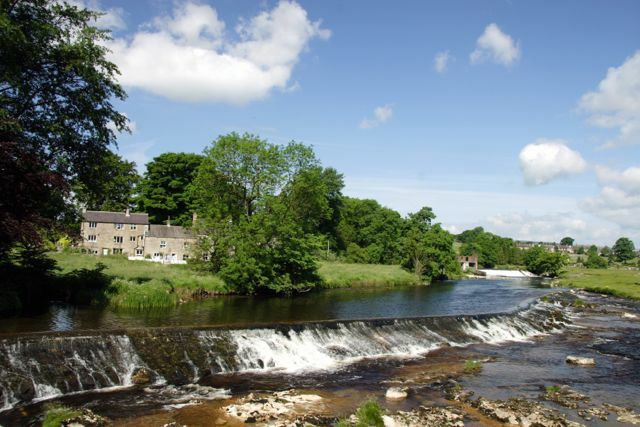 Enjoy a pint on the green in Linton outside the Fountain Inn, and then walk over the hill and down to the dramatic falls over the River Wharfe. My bed, after a hard nights work! The peace and quiet in Hetton at night time. Frank Carr, farmer and hopeless romantic. He’s shy, unassuming, hopeless at relationships, fabulous company, funny and more Dales than the sheep that eat its grass!